If you have any pertinent information regarding this "cave", G. E. Kincaid, Professor S. A. Jordan, or the Smithsonian Institute's alleged involvement in this story, please do not hesitate to contact me at vrartist@gci-net.com. or "anonymous" if you wish. for his own efforts at finding this cave and our combined effort to solve this mystery. An Analysis on the Probable Location of an "Underground Citadel"
according to a "Phoenix (Arizona) Gazette" front page news story dated "April 5, 1909"
First published June 27, 2001 at: "Lost Civilizations and Hidden Mysteries"
I have known of this location since 1972. I have held the secret since then. I feel it is the proper time to reveal the location. A front page story which ran in the "Phoenix (Arizona) Gazette", a major Arizona newspaper of the era, dated April 5, 1909, began with the headline, "Explorations in the Grand Canyon" "Mysteries of the Immense Rich Cavern being brought to Light" "Jordan is enthused" "Remarkable finds indicate ancient people migrated from the Orient." The story tells of a lone explorer, G. E. Kincaid, described as "an explorer and hunter all his life" and "thirty years having been in the service of the Smithsonian Institute", who was traveling alone, down the Colorado river, in a wooden boat, in search of "mineral". 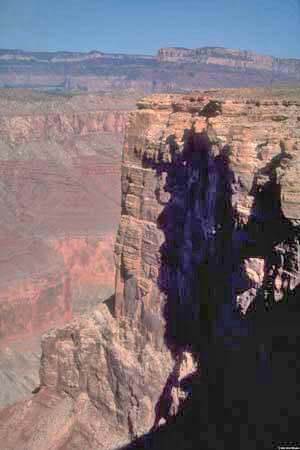 Mr. Kincaid claimed to have seen "stains in the sediment" on the east wall of the canyon gorge he was traveling through. He most likely landed his boat, and made his way up the east side of the canyon, and over a "shelf", then walked past "steps" to the "mouth of a cave" entrance. He went inside the entrance and discovered hallways, rooms, "mummies" "copper objects" and various other "artifacts" along with what appeared to him at the time to be "hieroglyphics" of an "Egyptian" or "Oriental" type. This is just a brief description of what he found and saw. The rest of the story goes on to relate how the Kincaid carried a few artifacts back to Yuma Arizona and then sent them off to Washington (presumably to the Smithsonian, although he did not say that specifically) who then went on to further investigate the site under the supervision of "S. A. Jordan" and a group of archaeologists a "group" that eventually was to amount to 30-40 persons. It is important to note here that S. A. Jordan was NOT named as a Smithsonian employee. The article only says he "supervised" the explorations. For the purposes of this analysis, I will try not speculate or go into reasons I may have to determine whether or not Mr. Kincaid's story is true or false. That separate subject I have dealt with at: Lost City of the Dead in the Grand Canyon. My purpose in this writing is to determine as best as I possibly can, from Mr. Kincaid's own words, and my own other experience and research, where the alleged "cave" and subsequent "citadel" might have been located (or "is" located, if it actually exists or still exists) in Grand Canyon National Park. I will determine what I think is the most likely location based on evidence gained from Mr. Kincaid's own description of the location, my knowledge of the Grand Canyon from twenty one hikes below it's rims, my extensive reading and research on the Grand Canyon, elevation data of the area from USGS topographic maps, mileage distances on the Colorado river, historical "place names" in the Grand Canyon, and geological "layers" in the Grand Canyon, along with various other sources of research, some of which are listed at the end of this writing in my "References and Notes". I will attempt to make a case for it's location at a relatively specific point in the Marble Canyon area of Grand Canyon National Park, adjacent to and possibly including a portion of the Navajo Indian Reservation, (the underground portion of the caverns) in north eastern Arizona. I will quote G. E. Kincaid's own words on the location as published in the "Gazette" story and add my reasons under each quote for my interpretation of his words and how they describe what I deduced to be the location back in 1972 and still believe is the location today. "First I would impress that the cavern is nearly inaccessible"
This implies that the location is very difficult to reach (at least in 1909 when Kincaid described it). I agree that the location would have been difficult to reach in 1909, and also, would be difficult (although less difficult than in 1909) to reach today. The location below the cave itself, is in a deep river gorge (Marble Canyon) accessible by either arriving there in a boat or float trip, or on foot from the rim of the Little Colorado river gorge, on the Navajo reservation. One could also hike from the Tanner Trail, or down the North Rim Nankoweap trail, cross the Colorado River (illegally) and walk the east bank to a point across from Kwagunt Rapids. Then the trip would necessitate a relatively level hike along the Colorado river in a northern direction for several more miles. In 1909 these options would have been considerably more difficult, either boating to the location in a hard shell boat (as Kincaid did), or hiking there on foot. The rigid boats of the period around 1909 were much more hazardous in the Grand Canyon's rapids than their modern equivalents, inflatable rafts. Also, in 1909 trails to the site would have been less known and less frequently traveled, making a hiking trip to the location much more hazardous. One could, in theory attempt a rim down climb to the area near the cave. "The entrance is 1,486 feet down the sheer canyon wall"
This alone shows that the "cave" entrance would be difficult to get to and would most likely involve rock climbing skills and be very dangerous. Cliffs such as this are common in Marble Canyon and vertical cliffs are also common near the river in this area. Kincaid's 1,486 feet is also an important elevation marker in determining the location of this site. I have been to the area above the three mile stretch of the canyon, where the cave most likely exists, and as you can see from the photo below, the cliffs just below the rim are very steep and impassable on foot. "I was journeying down the Colorado river in a boat, alone, looking for mineral. Some forty-two miles up the river from the El Tovar Crystal canyon..."
Here Kincaid states that he was "journeying "down" the Colorado river." "Down" a river (any river) is generally, if not nearly always construed to mean "with the current of the river." This usage of the word "down" has been confirmed by my conversations and correspondence with river runners, historians and in particular, Colorado river runners. Kincaid then goes on to use the term "up the river." "Up" the river is the opposite of "down" the river and generally construed to mean "against the current of the river" This has also been confirmed by the above sources. These terms would not generally be confusing in everyday conversation about a boat moving along a river, but I clarify them here because they are critical terms in determining Kincaid's stated location of the cave. The Colorado river runs from a northeastern location in Marble Canyon, in a south and southwestern direction, down through the Grand Canyon proper. The current runs from north to south in the area Kincaid describes. Kincaid in refers to the location of the "cave" as being a certain distance from "El Tovar Crystal Canyon". The name, "El Tovar" originated historically from "Don Pedro Tovar", one of the Spanish explorer Coronado's captains, who in August of 1541 was sent to explore the Cebolla "country", located in the province of Tusayan. (north eastern Arizona near the Hopi lands) Tovar found the "Moqui" (Hopi) villages whose inhabitants informed him that there existed a "great river" several days journey to the north. (The Colorado of the Grand Canyon) Tovar reported this back to Coronado who sent Captain Cardenas to "seek the great river". Cardenas eventually reached the river and the great cliffs of the Grand Canyon (yet to be named "Grand"). Some of his party tried to cross the great gap of the canyon and failed, unable to get down the sheer walls and steep slopes of the canyon.1 Cardenas has thus been granted the historical distinction of being the first non Native American ("European") to see the Grand Canyon. In the Phoenix (Arizona) Gazette article of April 5, 1909 it is stated that Kincaid "brought the story" of the "underground citadel" "to the city" (Phoenix and the Gazette) "yesterday" (April 4, 1909) after having "discovered" the site "several months ago". This would imply that Kincaid discovered the citadel in 1908 or 1909. I now know that he most likely discovered the site in October of 1908. It is possible then that he knew of the El Tovar Hotel (opened in 1905) and could have been referring to the hotel's name in reference to "Crystal Canyon". The mouth of Crystal Canyon (Crystal Creek actually) should be visible from a window of the hotel, or somewhere near the hotel (a rim viewpoint) and Kincaid simply used the Hotel as a reference point that readers of the Gazette could relate to, since the hotel was a brand new feature and a prominent place to stay at the rim. The middle to upper reaches of the Crystal Creek canyon area should be visible from El Tovar Hotel (see map below) . In any case, the only other modern public structure currently anywhere near Crystal Creek is Phantom Ranch, and that was built in 1922 several years after Kincaid's discovery and the appearance of the Phoenix (Arizona) Gazette article. The El Tovar hotel seems to be be the nearest publicly known reference point to Crystal Creek (canyon) that the readers of the Gazette could relate to, and it was probably used in that regard, by Kincaid as a reference point for the general public. 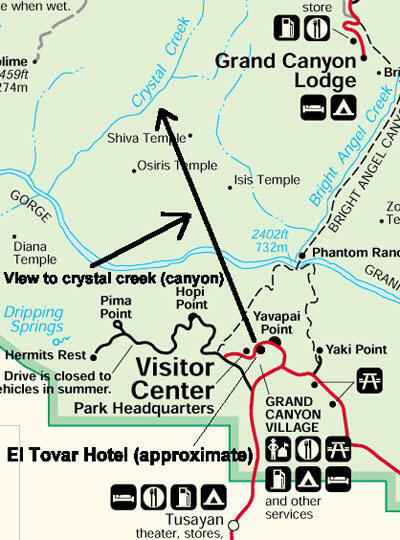 The importance of "El Tovar Crystal Canyon" is that it most likely refers to Crystal Creek and it's surrounding canyon. In an extensive search of the Grand Canyon area, referring to historical journals, several historic and modern maps, hiker's guides, rangers, Grand Canyon historians, Grand Canyon Place Names and numerous other sources, I am unable to turn up any reference to "El Tovar" Crystal Canyon. The only other location that comes near to the name "Tovar" is "Tobar Terrace" further west in the Grand Canyon, but "Tobar" Terrace is bordered on the east by "Blacktail Canyon" and on the west by "One Hundred and Twenty Two Mile Creek". Both names are not even remotely near the name "Crystal Canyon" referred to by Kincaid in 1909. Various sources agree that the reference most likely refers to the canyon in which Crystal Creek flows, a side canyon off of the Colorado river in the heart of Grand Canyon. I agree that Kincaid was most likely referring to "Crystal Creek" and it's associated canyon at mile 98 on the Colorado River in the Grand Canyon, especially since "Crystal Creek" is commonly labeled on Grand Canyon maps, and maps dated to the period when Kincaid traveled the river. 1903 map showing Crystal Creek. Designated points along the Colorado river in the Grand Canyon are referred to with numbers such as "mile 98" above. These points reference a distance on the Colorado river from Lee's Ferry, Arizona, a common starting point for many Colorado river float trips. Crystal Creek. The most likely candidate for Kincaid's "El Tovar Crystal Canyon", and it is at is at mile 98. "Some forty-two miles up the river from the El Tovar Crystal canyon"
Subtracting 42 miles from mile 98 leaves mile 56. Remember that "up the river" is "against the current" and in the Grand Canyon, this means up toward Lees Ferry. Mile 56 is at Kwagunt Creek or Kwagunt rapid, in Marble Canyon. 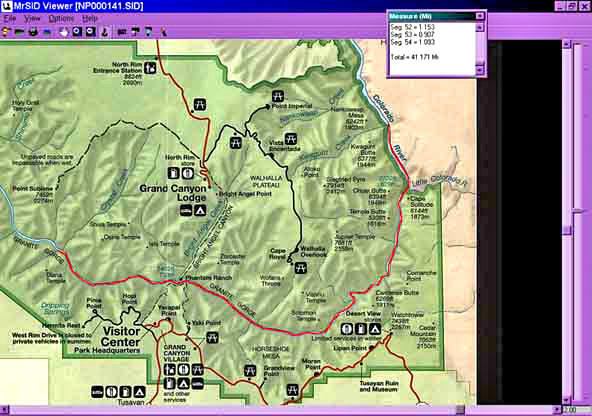 Map of Grand Canyon National Park showing Kincaid's "42 miles" as a red line on the river. Marble Canyon got it's name from Major John Wesley Powell, who in August of 1869, wrote in his journal about "cliffs of marble" which contained "a great number of caves". It is important to note here Powell stated that Marble Canyon contained "a great number of caves". The "citadel" Kincaid speaks of in his story is in a "cave". "Marble Gorge" Canyon or gorge in Colorado river between mouths of Paria and Little Colorado, so named by Major Powell 1869. We have cut through the sand stones and limestones met in the upper part of the canyon and through one great bed of marble a thousand feet in thickness. So we call it 'Marble Canyon. It is 651/2 miles long. "As the formation was mainly a fine-grained gray marble, Powell concluded to call this division by a separate name and gave it the title Marble Canyon." "Some forty-two miles up the river from the El Tovar Crystal canyon, I saw on the east wall, stains in the sedimentary formation..."
that most likely still hides G. E. Kincaid's Lost "Cave"
Back in 1909 Kincaid has most likely followed the turn in the river here at mile 56 headed due south. In his search for "mineral" he looked up and saw on "the east wall, stains in the sedimentary formation about 2,000 feet above the river bed". Several of Kincaid's observations are very important here. 1. Kincaid notices the "stains" on the east wall. 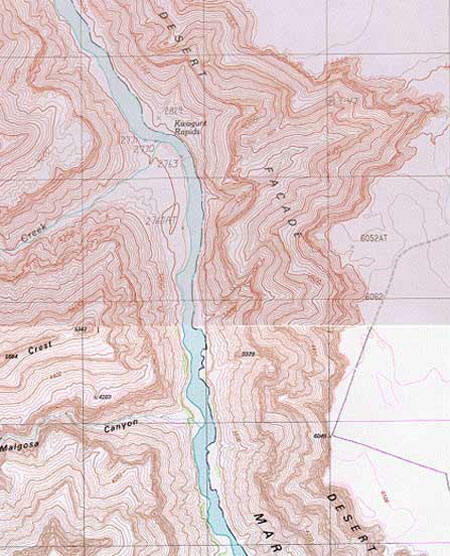 Looking at the topographic map, it is easy to see that he would have been in a position on the river to be just next to an "east wall", immediately after passing through Kwagunt rapid. 2. The "stains" according to Kincaid were "in the sedimentary formation". This is very important. The geology of the Marble Canyon region is basically a record of altered sedimentary deposits. From the rim to the river in Marble Canyon there are successive layers of modified sedimentary deposits. 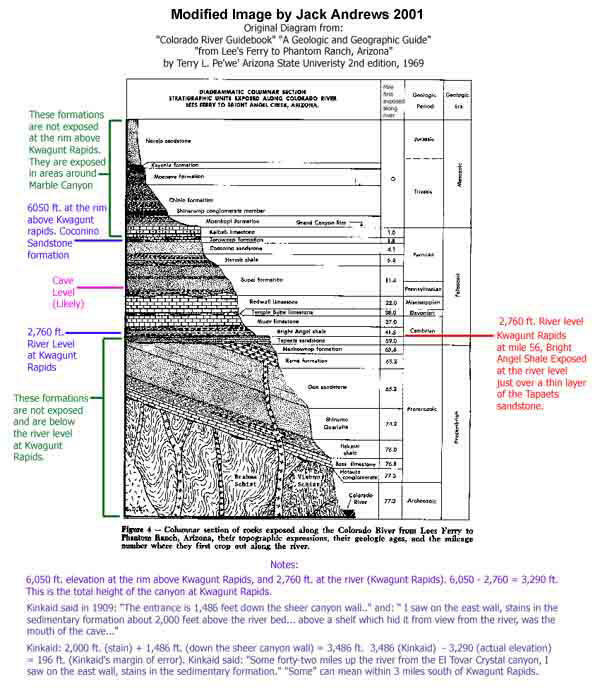 You can see this in the diagram below, which lists the various formations from rim to river. I have delineated the formations present in Marble Canyon, in the diagram. Most all formations had their origins as sedimentary deposits. It is important to emphasize here that in this particular stretch of the Grand Canyon, "Marble Canyon", modified sediment types reach from rim to river. Further south and west in the Grand Canyon the "Inner Gorge" of the Colorado (1200-1900 or so foot high) cliffs along both sides of the river, are made up of the Vishnu Schist, a 2 billion (or so) year old formation, dark brown in color of extremely altered sandstones shales and limestones, intermingled with lava flows. It would take a stretch of the imagination to see Kincaid looking up at the nearly glassy dark brown surface of the Vishnu Schist and calling it "sedimentary formation". Also, immediately above the Inner Gorge (Vishnu Schist), is the "Tonto Platform" a nearly horizontal platform of gently rolling hills, that extends for some distance horizontally away from the edge of the Inner Gorge. It is not a formation known for caves. Kincaid said he saw "stains in the sedimentary formation about 2,000 feet above the river bed". In the Inner Gorge area of the Vishnu Schist, if Kincaid looked up, he would have see only the edge of the Vishnu Schist at about 1200-1900 feet, and not have been able to see much if anything of the horizontal Tonto Platform, just above the Inner Gorge, which would have been out of his line of sight (horizontal). He would not have seen "stains in the sedimentary formation", since the Vishnu Schist id hardly "sedimentary". He also would have also been located incorrectly on the river, since he would not be even near "42 miles up the river from El Tovar Crystal Canyon" (Crystal Creek and canyon), if in the Vishnu Schist area of the Inner Gorge. 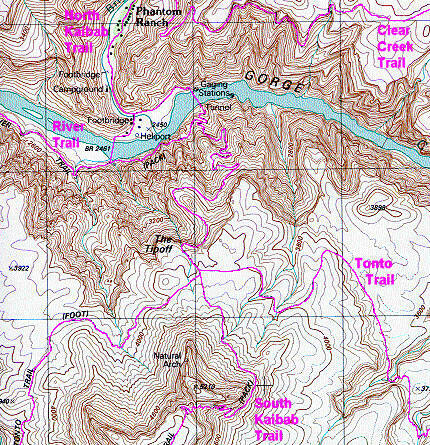 USGS topo map below, showing the Inner Gorge (Vishnu Schist) As "Granite Gorge", in the central area of Grand Canyon National Park. The area shown as "Granite Gorge" ( says "GORGE") is the "Inner Gorge" "Vishnu Schist" formation, next to the river. It is also true that views in Marble Canyon, at river level are somewhat limited, due to the steep walls of the redwall formation, just above the river. 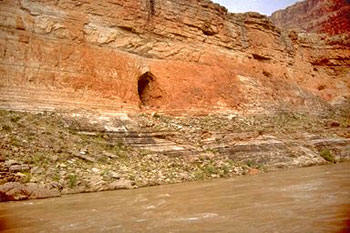 But at mile 56 on the Colorado River, in Marble Canyon, there is a large gap in the vertical walls that would allow a clear view up to the 2000 foot level near where Kincaid said he saw "stains in the sediment". If we subtract 2,760 (river at ground level) feet from 6050 feet (rim at top) we have 3,290 feet as the actual height of the canyon at Kwagunt, from river to rim. "I saw on the east wall, stains in the sedimentary formation about 2000 feet above the river bed"
If we add Kincaid's two figures, 2000 feet and 1,486 feet we come up with 3,486 feet as Kincaid's height from the river to the rim. That figure is only 196 feet in variation from the actual height (river to rim of 3,290 feet) at the present day location!! 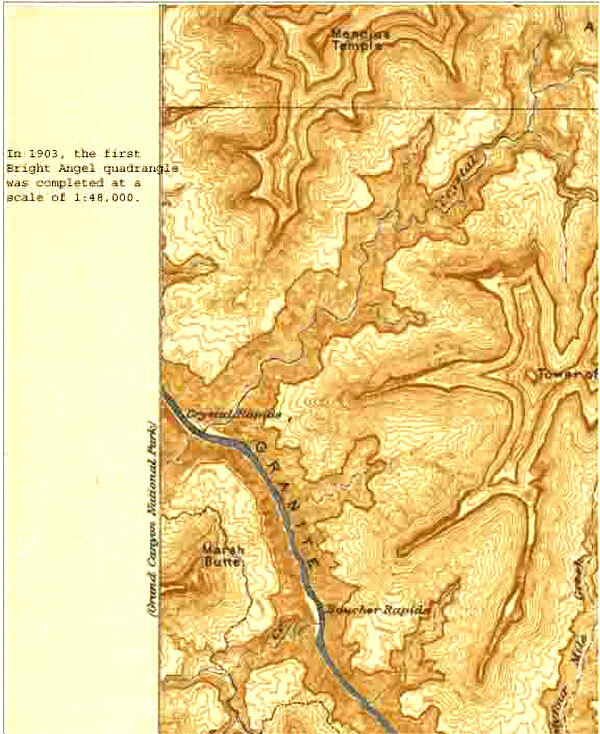 Considering that the rim and river elevations vary almost 200 combined feet in that 6 mile stretch of canyon, it is evident that Kincaid's measurements are highly accurate in to the area in which he stated that he saw the cave. For the reasons detailed above, I think the "cave" described in the headline story of the Arizona Gazette, April 5, 1909 and its fantastic underground installation was, and still may be, located above an approximate six mile stretch of the Colorado River in Marble Canyon, at the border of Marble Canyon and the Navajo Nation above an area near Kwagunt Rapids. 6. Halka Chronic, Roadside Geology of Arizona, (Mountain Press Publishing Co., Missoula, February 1989, 6th Printing), on page 280 the author describes the Vishnu formation, and it is this discussion I refer to in my text.